The need for a local militia or “Home Guard” grew out of fear of a Japanese invasion of the British Columbia coast during the Second World War. The Coastal Defence Guard was created early in 1942, on August 12 they became the Pacific Coast Militia Rangers (PCMR), a corps of the Active Militia. The PCMR was disbanded at the end of the war but two years later, in 1947, the Canadian government recognized that militia were still required, particularly in the north, and the present-day Canadian Rangers, modeled on the old PCMR, was created. 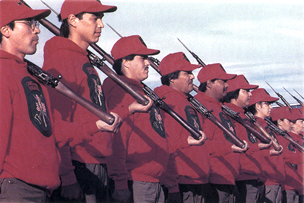 Today there are 4,000 mostly Inuit and Aboriginal Canadian Rangers, in 165 communities across Canada, who are easily recognizable in their red sweatshirts and ball caps.